The third, or Kindergarten, year is one of completion in the Montessori Children’s House. In this year, students begin to reach internal mastery of their work, and they begin to demonstrate great competence. The curriculum provides more in-depth lessons for math, reading, and language, as well as science, geography and cultural studies. They also have the opportunity to be leaders in the classroom, mentoring their peers by reading, teaching concepts, or helping to tie shoes. 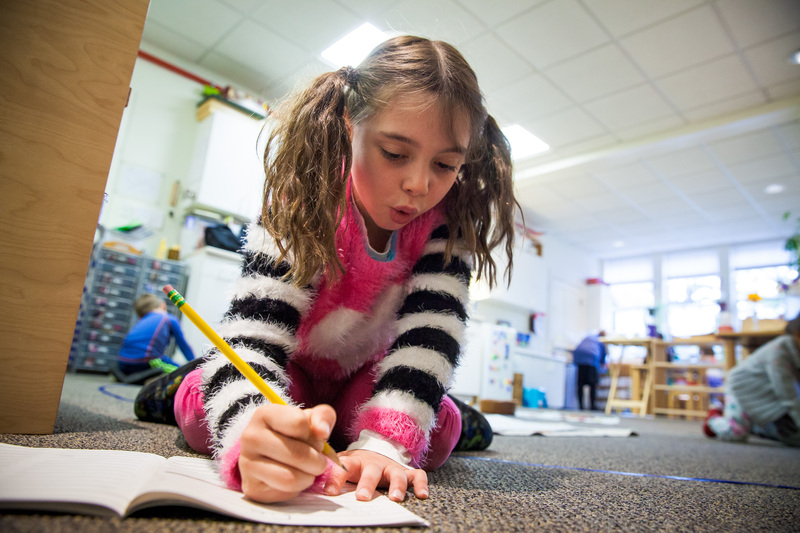 Kindergartners learn to have greater independence and freedom, and they love it. The Kindergarten Literacy Program at Summit is comprised of two major components: Writing Workshop and Reading Workshop. The children meet two hours twice a week for an intensive hands-on approach to learning to read and write. In the Writing Workshop, children and teacher engage in Shared Writing, Independent Writing, Handwriting and Nature Study. In Shared Writing teacher and children write together, with an opportunity for children to learn phonics, punctuation and the mechanics of writing. Lessons are interactive with children being encouraged to write a word, and are reinforced as children read back their dictated sentences. Independent Writing gives children an opportunity to write and practice what they learned. Handwriting practice involves forming letters correctly from top to bottom. The Handwriting Without Tears Program is used. Nature Study demonstrates another process for writing. Children observe a process such as planting seeds and charting their growth or journaling the metamorphosis from tadpoles to frogs. In Reading Workshop a predictable amount of time is set aside to engage in and learn about all aspects of reading including Read Aloud, Guided Reading, Independent Reading, Listening, Shared Reading. Numeracy is a hands-on math program that will incorporate the Montessori philosophy along with best practice to introduce and work with concepts such as measurement, time, and money. Numeracy is an enhancement to our Montessori Math curriculum that corresponds to the Common Core Standards for Kindergarten. This program provides the Kindergarten children with in-depth exposure to concepts including word problems, measurement (number lines, number grids, bar graphs, estimation), time (telling time on analog and digital clocks, the functions of the hour and minute hands), and money(identification of penny, nickel, dime, and quarter, associated values, making change, working with $1, and $10 bills). This program will complement the work that is done in the classroom and provide the children with an expanded, well-rounded, and even more accelerated Math experience during their Kindergarten year.